Reforms to the U.S. immigration system that would allow high-tech companies to hire more skilled employees from overseas are possible this year, the U.S. Secretary of Commerce said on Wednesday. 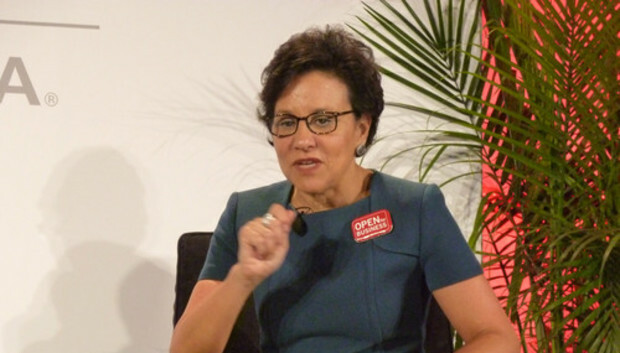 "There's an enormous window in the first half of this year to actually get immigration reform done," said Penny Pritzker, who was speaking at the International CES expo in Las Vegas. "I think the momentum is building." Last year, a bill passed through the U.S. Senate that increases the total number of H1B visas that are available to some U.S. businesses each year while putting restrictions on others. The House of Representatives has yet to move on immigration reform for highly skilled workers and is looking at several competing bills. "I am hopeful and optimistic that [House Speaker John] Boehner is willing to bring one of those bills to the floor and if that happens there are the votes for an immigration bill. We can get a consensus bill out of that. I am an optimist and I believe this is doable this year and it's a high priority this year for the administration," she said. Pritzker credited the "huge economic benefit" that highly skilled immigrants bring to the U.S. economy and noted the high number of candidates pursuing PhDs at U.S. universities who are from overseas. She put the share at about 50 percent of those in science and mathematics and 57 percent in engineering. "We need to be keeping these folks in this country," she said. Pritzker's remarks came an hour before the CEA, the biggest lobbying group for the high-tech industry, was due to deliver a call for more action on reforms to the immigration and patent systems. The association, which puts on the International CES expo, is united with many of Silicon Valley's largest high-tech companies in campaigning for IT businesses to be allowed to hire more highly-skilled workers from overseas.